This is absolutely nonsense and shows how the coupling of Wall Street and the government have simply turned education into another commodity to water down and gamble on. Like the multiple card game tables in Las Vegas higher education is the hottest game in town. 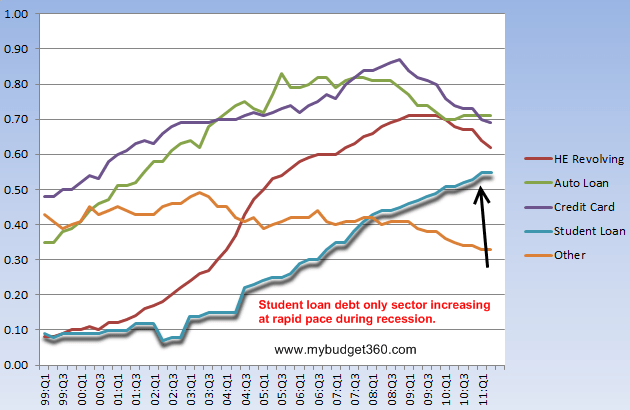 But unlike credit card debt, student loan cannot be reset or forgiven in bankruptcy court. It’s a permanent burden on the former student. The Department of Education recently announced that the national student loan default rate has risen to over 8 percent and we know that this measure provides only a limited view of the troubles that borrowers are having repaying their student loan debt. In the current economy, we can only expect things to get worse unless the Education Department tackles this problem head-on. Among the defaulters are a large percentage of unemployed college students. It’s bad enough to be unemployed; however, when you add to this difficulty with being classified as a defaulter, you are really in trouble. Defaulting on federal student loans results in a lifetime of financial purgatory — it destroys your credit, making it impossible to obtain a credit card, car loan, and home loan, and it puts you at risk of having your wages garnished, and your tax refunds intercepted by the IRS. The student loan market is back in the news as it makes its unrelenting march to the $1 trillion mark. This crippling figure comes in the face of a decade of lost wages for middle class Americans. Just like the housing bubble people were supplementing a disappearing middle class with more debt. The allure of housing was that never in our history have we seen national home prices fall, until they did in dramatic fashion. The same cultural nostalgia for education in every respect has created a zombie higher education system that is now expanding like the mortgage markets at the height of the housing bubble. Why? For-profit schools have largely lured in countless Americans into a system that has provided very little economic gains for students while enriching these Wall Street listed companies. It should come as no surprise that the highest default rates stem from the for-profit system and most of these loans are federal loans. In 2010 there were $100 billion in student loan originations, the highest ever in the midst of the deepest recession since the Great Depression. But it also spells a crisis on a much larger scale. Reports are showing that the OccupyWallStreet movement (#OWS) is partially made up of significant numbers of young people and recent graduates in particular. These are not the “dirty hippies” and “degenerates” that many conservatives have labeled them. Rather, they are the people who followed the “rules”. They studied. They went to college. In large numbers they took responsbility for their future by taking on student loans and investing in their human capital – all things society has told them to do. Now, almost 4 years since the recession began, there aren’t any jobs for them. They’ve graduated and now face payments on those loans. But the jobs simply don’t exist. When young people are educated and then are denied opportunity, there’s danger for society. That’s the recipe for revolutions as we’ve seen in Tunisia and Egypt already this year. Perhaps if the federal government hadn’t foolishly wasted $10.2 trillion more than it took in as revenues since 2001 ($4.3 trillion since Obama took office) then there might be enough money to help create jobs so students could pay the debt obligations that they and their parents agreed to of their own free will. Not paying one’s bills individually and nationally is a recipe for economic Armageddon… as we are see evolving in Europe and the United States.